So this is more of a meal idea than an actual recipe. I had some tahini sauce leftover from our lamb meatballs from last night, and I had some bland old chicken breast sitting in the fridge, so I decided to combine them. I cubed up the chicken and tossed it in a plastic bag with whatever Mediterranean-y stuff I found in the kitchen...olive oil, red wine vinegar, sea salt, oregano, onion powder, garlic powder, paprika, cumin. I didn't measure anything. I bet this would be great with just about anything you put in there. I let the chicken marinate for about 45 minutes and then I broiled it for 15 minutes. It was very good dipped into the leftover tahini sauce. 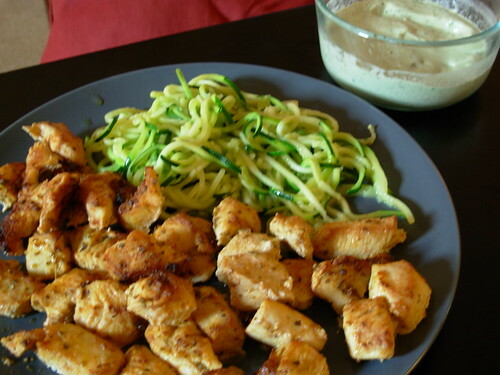 For a side dish I put a zucchini through a spiralizer to make it like noodles and sauteed it in olive oil for about 10 minutes while the chicken was broiling. Cover a small baking pan with foil and roast the eggplant for 1-1.5 hours at 375 degrees, or until the eggplant is soft. Remove from the oven, peel, and mash with a fork. Set the flesh in a strainer and let the liquid drain off. Combine the mashed eggplant, lamb, egg, oregano, and sea salt in a large bowl. It will be pretty goopy. Form mixture into meatballs. I like to use a tablespoon measure - if made with heaping tablespoons you should get about 26 meatballs. Heat a skillet over medium heat. If you use a nonstick skillet, no fat is necessary as the lamb will render out enough. If your skillet is not nonstick, you might want to grease it. 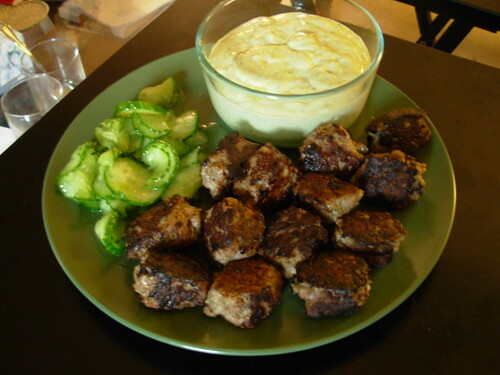 Fry the meatballs on three sides until they are nicely browned. Toss everything in a food processor and let it rip til it's smooth. It's better to make this at least an hour in advance to let the flavors meld (I make the sauce after I stick the eggplant in the oven and then pull it out of the fridge at serving time). Score the cucumber with a fork and then slice it into thin rounds. Put the cucumber slices into a strainer or colander and sprinkle with sea salt. Put something heavy on top and let it drain while everything else cooks. Right before serving, squeeze out all the remaining water and drizzle on some red wine vinegar and extra virgin olive oil. Heat some bacon grease in a large heavy skillet over medium high heat. Pound the pork chops to make them thinner. Coat each side with a little bit of sea salt and a liberal amount of black pepper. Sear the pork chops for 2 minutes on each side and remove to a plate. Add the wine, stock, and mustard to the drippings in the pan and deglaze. Reduce slightly until the sauce starts to thicken a bit. If you want it thicker, mix a pinch of arrowroot powder with a teaspoon of cold water and then add it to the sauce. Pour the sauce over the chops.